3mm, Does it Make a Difference? I have always wondered if 3mm would really make that much of a difference in the scheme of wide angle lenses. I recently had the chance to experiment with the 11-22mm lens compared to my 14-54mm lens and it does! Now a couple of factors here before I show you the difference. So the 11-22 is a 22-44mm lens and the 14-54mm is really a 28-108mm lens based on a 35mm camera, or full frame sensor camera like a Nikon D800. I shot the same scene on different days, but shot from the exact same location. I remember because it was the only cover from the rain above me in the 14mm picture so I made sure I stood directly under the same tree limb for the 11mm one. The first picture was shot during Hurricane Sandy, notice the flooded area behind the pagoda. The second picture was shot 2 days after the Hurricane, hence the green grass behind the pagoda. Take a look at both pictures individually. 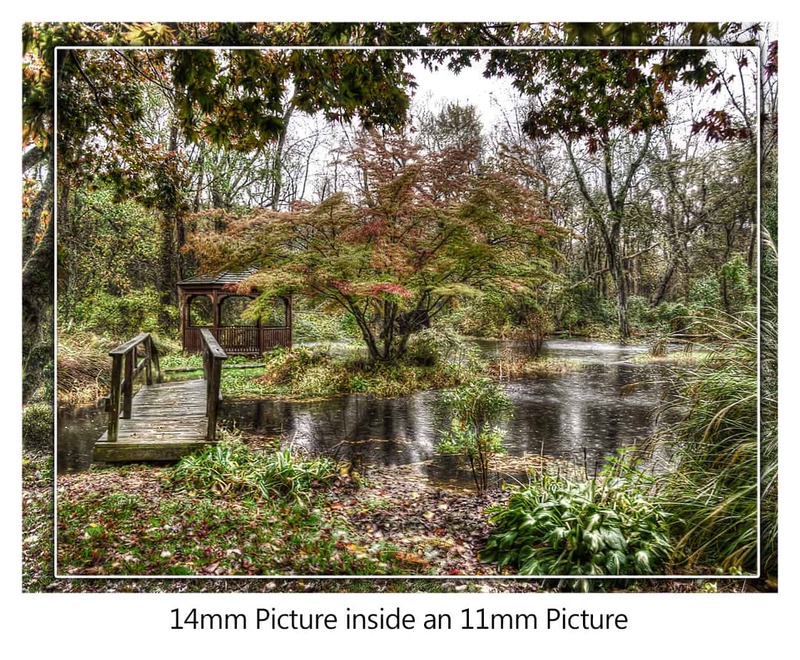 Now take a look at how the 14mm picture fits into the 11mm one. Due to some lens distortion it was difficult to get the picture to fit exact, but you can really see how 3mm can make a huge difference. You can fit a whole lot of landscape in one shot! It can give you some really interesting perspective shots. In the image above the lens distortion was able to capture more of the tree on the left, a lot more! Can warp the focal point of the scene, almost pushing it back due to the wide angle distortion (look at the difference in the pagoda size). May need to do a little bit more work in post to get lines straight. Many extreme wide angle lenses don’t tend to have too much focal length range making them difficult to work in multiple applications. 3mm makes a huge difference! If it is in your budget to grab another lens that will give you that extra 3 mm, by all means do so! It will only open you up to a world of possibilities in the interior and landscape areas of photography. for some reason i prefer the 14 mm in this shot, there´s enough of the leafs of the tree on the left and enough of that bushy trees on the right, and the main subjects being the centered tree, wood bridge and hut. I suppose it all goes down to the composition, but great to see this 3mm comparison.